These pages will give you registration, viking names and other data for the SAS fleet, both present and earlier aircrafts. Many thanks to Hans Åkerstedt, fellow DC9 captain, for all support in tracking SAS former aircrafts. Convair 900 1962 - 1966. Douglas DC-8 1968 - 1987. Boeing 747 1971 - 1999. Mc Donnell Douglas DC-10 1973 - 1991. 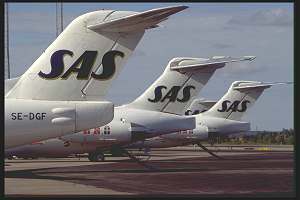 Fokker 28 1973 - 1992 Linjeflyg (Swedish domestic)- 1999 SAS. Mc Donnell Douglas MD-80 1985 - ?? Boeing 767 1989 -- ?? Mc Donnell Douglas MD-90 1996 -- ?? SAAB 2000 1997 -- ?? Boeing 737 1998 -- ?? Bombardier/De Havilland DHC8 2000 -- ? ?